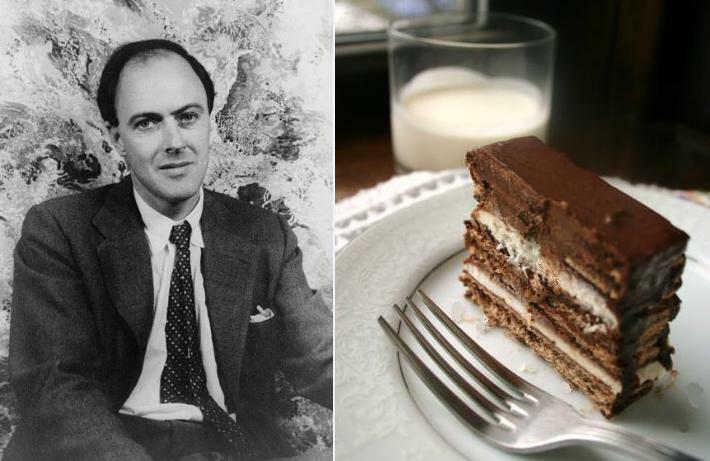 Besides the pink milk, one of Dahl’s favorite creations was a dessert he dubbed “Kit-Kat Pudding.” There’s not much to the recipe, as his wife Valerie noted: Just unwrap some Kit-Kats, layer them with healthy dollops of whipped cream in between, freeze the whole thing and you’re set. It’s a giant Kit-Kat ice cream sandwich. But I thought we could do it one better—after all, while I can appreciate the textural genius that is the Kit-Kat bar, my main complaint is there’s not enough chocolate there. Dahl, too, would pass over things like chocolate cake for a more decadent treat out of his special chocolate bar stash. “I prefer my chocolate straight,” he wrote. This no-bake cake definitely solves the chocolate problem; making your own ganache is incredibly quick, simple, and packs the punch of chocolaty flavor regular Kit-Kats lack. With layers of crispy wafers and homemade whipped cream, it’s a giant frozen chocolate bar that might just loosen candy companies’ hold on us once and for all. So long, Slugworth. 1. Make the ganache: Coarsely chop chocolate and add to a medium heatproof bowl. In a small saucepan over low heat, bring 1/2 cup cream to a simmer. Pour over chocolate and let sit 5 minutes. Add butter and stir until texture is smooth. Set aside. 2. In a large bowl, using an electric mixer, beat 1 cup cream on medium speed until soft peaks form. Sprinkle sugar over whipped cream, then beat again until just incorporated. 3. Assemble the cake: Line a large plate with parchment paper. Lay 6 wafers side by side to create a large rectangle. Cover with a layer of ganache, then top with another 6 wafers. Add another layer of ganache and cover with a 1/4-inch layer of whipped cream. 4. Continue assembling in this pattern (wafer, ganache, wafer, ganache, whipped cream) until no wafers remain. Spread ganache over top of the cake, allowing extra drip over the sides. 5. Freeze cake at least 4 hours, until ganache has set. Cut and serve immediately. I’m awful – all I can remember about ‘Boy’ is the part where they put a mouse in the candy jar? Not nearly as delicious. I love your blog and the way you link food to authors and include a recipe. Have to agree with Dahl–cream eggs are awful. My husband loves them though. Maybe they are like marmite? Thanks so much! My boyfriend and I have opposite taste in sweets, too. He likes Skittles. Skittles! Terrible. Kit Kat cake! I’m a big fan of Dahl, ice-box cakes and chocolate mostly. I’d love this! All three of those things are indeed great. Ice-box cakes are my new favorite! Let me know how it goes! It’s definitely reminiscent of a Kit-Kat, just more … intense. That looks simple and delicious! Love the final photo too. It’s easy to make a whole bunch of chocolate look good 🙂 Thanks for reading! Wonderful! And, like Dahl, I believe the Crème Egg is possibly the most disgusting thing ever created. Agreed – just not into them. They’re so … gooey? I think it’s the goo that kills it for me.